Looking for a healthy holiday cookie? 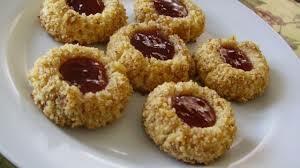 Try making Surya’s Thumbprint Cookies! These are the healthiest and most delicious cookies I have ever eaten. Many thumbprint cookie recipes are laden with white sugar, white flour and butter. These are a delightful, wholesome alternative created by my dear friend, Surya, a yogini and macrobiotic cook extraordinaire. They quickly become a favorite of anyone who eats just one, if you can limit yourself! Grind almonds until mealy in a blender. Grind oats until mealy in a blender. Combine all ingredients together. Coconut oil is solid at room temperature, so you may need to heat it to liquefy it before adding. Make small balls (with about 1 tablespoon of batter) in your hand and then press your thumb into the center. 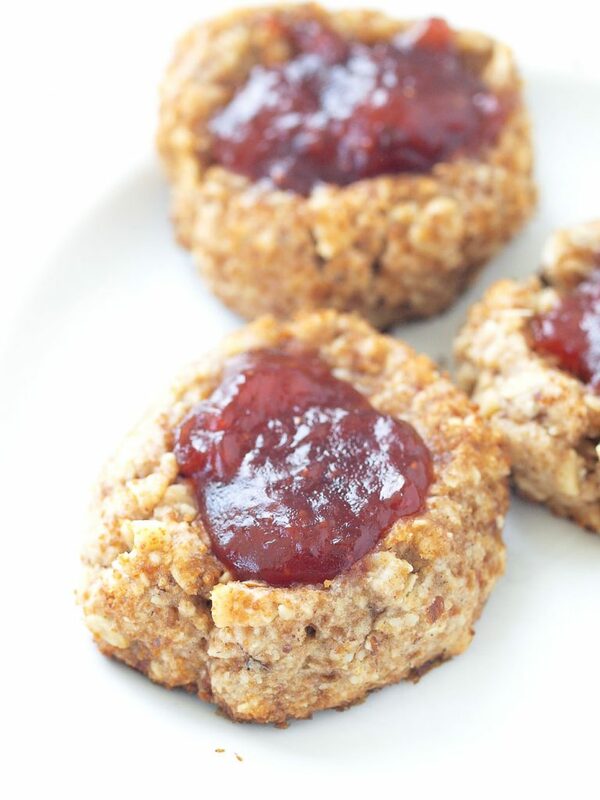 Place on a cookie sheet and fill the center with jam. Notes: Almonds are chock-full of important minerals: copper, manganese, magnesium, selenium, zinc, potassium, calcium, and vitamin E and healthy fats. Grinding the almonds yourself ensures their freshness, although you can purchase almond meal (just ground up almonds) to save time. Rolled oats are full of fiber, B vitamins, iron, and a host of other minerals. Coconut oil adds a rich yet light flavor. Gluten free folks can use gluten free oats and use your favorite GF flour. If you use another oil, choose something other than olive. Cinnamon and cardamom lighten the richness of the maple syrup and oil. Look for a fruit juice-sweetened jam, which tastes the best and has no added sugar. I like raspberry or strawberry. These cookies look beautiful, are wonderful to bring to a potluck dinner, and can be enjoyed any time of year. Vata and Pitta types can enjoy freely. Kapha types can make their own variety with a smaller amount of canola or sunflower oil instead of coconut and increase the spices by ¼ tsp each. ENJOY!